À cette page en Français, veuillez cliquer ici. Release 2.1 did not work correctly for the MEGA2560. It contained a serious error. But an additional wire has to be soldered. See new manual on download page. – Communication speed with Putty raised from 9600 baud to 57600 baud. The ArLoco is a 16(UNO) or 58(MEGA2560) channel feed back encoder with LocoNet®. It uses a special Arduino shield that includes 16 inputs for channels, a power supply for the Arduino and two RJ12 connectors for LocoNet. On a MEGA the normal MEGA pins must be used for sensors 17-58. Use of a maximum of 256 addresses. So for each ArLoco you have to specify the required address range (1-16, 17-32,…, 241-256). Optimised for both pulse detection (like reedswitch) and continuous detection (like current detection). Simple configuration with your PC. So no complex CV-programming! Generates a fixed length pulse of 1 second. Ideal for use with reedswitches. This went together very easily thanks to following the clear instructions. I’m using it along-side some Digitrax BDL16 units. Make sure that the number you assign it doesn’t duplicate a number assigned to a BDL16 as it won’t be recognised. This may seem obvious, but wasn’t to me initially. Just a question: does the okkie also work/report to a dcc++ arduino or to jmri? Okkie is just a passive electronic circuit and thefore not related to any software product. The output voltage of an Okkie drops to zero if a current is detected on the input. It must be connected to a device(like an Arduino) that holds the Okkie output at 5 V by a pull up resistor. 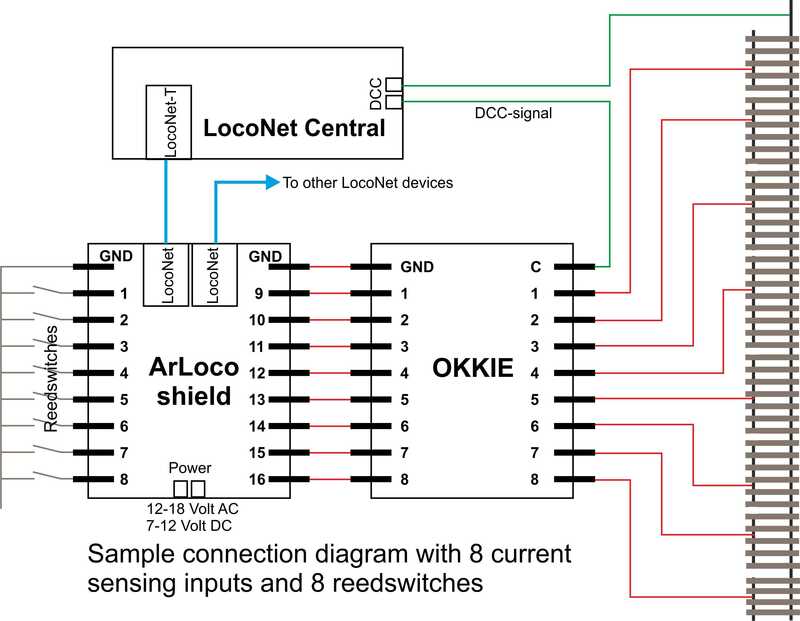 The ArLoco shield and sketch ‘produces a LocoNet signal that can be picked by other LocoNet devices. Therefore there is no relation with DCC+ or JMRI. I’m new to Arduino, I was trying to load your code using the Arduino IDE but was getting an error. Then after doing some google searching, I was told to use version 1.06 and that worked. I see, Mostly it is caused by a corrupt bootloader. On my download page there is a document on how to fix this. Why did you use thr IDE? You don’t need it. ArLoco is automatically uploaded when you start ArLoco the first time. 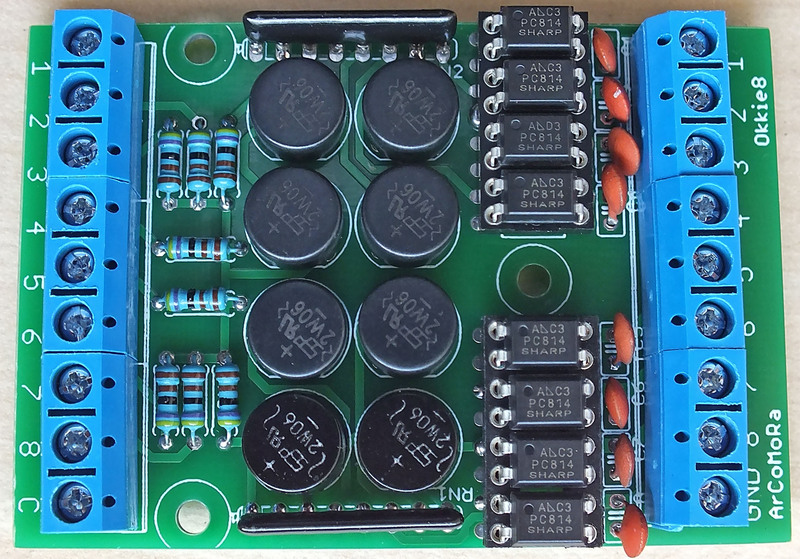 Do you have a version of this board that has 16 outputs instead of inputs ? What do you want with 16 outputs? It is a feedback encoder and all such encoders have only inputs. Please explain. has 16 inputs for pushbuttons and 16 outputs for led’s. You can control upto 12 servo’s without led indication or 8 servo’s with led indication with 12 momentary switches. First of all, thanks for a nice piece of work!! and it has 1 to 16 sensor inputs. How is the OKKIE powered, and what is it’s (idle / max) power consumption (or current draw)? Won’t the diode bridge design cause a voltage drop of about 1,5v of the track power, causing trains on a track section monitored by OKKIE to run a little slower than on a track section without OKKIE? The ArCoMoRa generates a DCC signal to Loconet depending on its inputs. I guess the DCC signal would be replicated in the track signal. Would these DCC signals be able to used by the MarDec to activate accessories attached to the MarDec? Arcomora generates nothing. It is just a name for a railway automation concept based on an Arduino. Mardec and Arsidec are sketches that generates nothing but uses DCC to control accessories attached to the Arduino. ArLoco is a sketch that accepts and generates LocoNet signals for occupancy information. 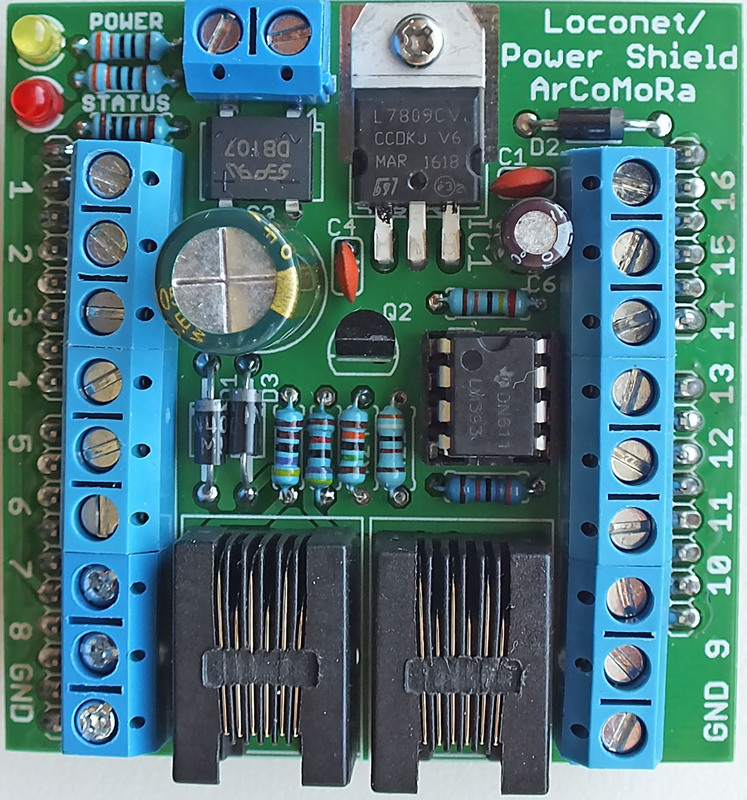 The ArLoco shield can use the DCC signal on pins 1 and 6 of the LocoNet cable for powering the ArLoco shield but does not use the information in it. ArLoco does certainly does NOT generate DCC signals. Yep, I think it’s becoming clearer. Thanks for your response.